Dave Lewis has stopped the rot. The chief executive of Tesco took on a huge challenge when he started the top job at Britain’s biggest grocer last September. The 6.4 billion pound pretax loss for last year, announced on April 22, was one of the worst in UK corporate history. There’s brightness in the underlying picture. But the number shows the depth of Tesco’s malaise. The sheer size of the loss reflects a healthy corporate acceptance of the fundamental changes in Tesco’s markets. The 2014 annual report gave a market value of 34 billion pounds to Tesco’s properties. This year, it wrote off 4.7 billion pounds, a sum equivalent to 14 percent of that total. The cutback reflects lower expected future profit. Shoppers, notably in the UK, want lower prices and better service, and are less keen on travelling to Tesco’s large out-of-town superstores. Many of the property mistakes are in the past and Lewis’ planned operating improvements seem to be underway. True, sales in comparable UK stores, excluding fuel, are still falling. But the most recent quarterly decline is 1.2 percent, much less than the 5.5 percent in the last quarter before Lewis started. For the also troubled international operations, the decline was 3.7 percent in the second quarter and 1.9 percent in the fourth. Lewis wants Tesco to please its customers more, and he seems to be succeeding, largely through lower prices and more costly service. Cost cuts are promised, but for now shareholders are suffering. However, the massive writedowns suggest that shareholders’ past gains were exaggerated. The retained earnings account, which was 9.7 billion pounds in 2014, is now 1.9 billion pounds. Net debt had been on a downward trend, but last year rose from 6.6 billion pounds to 8.5 billion pounds. A 50 percent cut in capital expenditure and a cancelled dividend will help the balance sheet. Asset sales – of the Asian operation, perhaps – could quickly transform the group’s financial footings. But the shares have rebounded 45 percent since December. They now trade on a forward earnings multiple of 22. Investors could be assuming Dave Lewis will do more than is plausible, sooner than is likely. 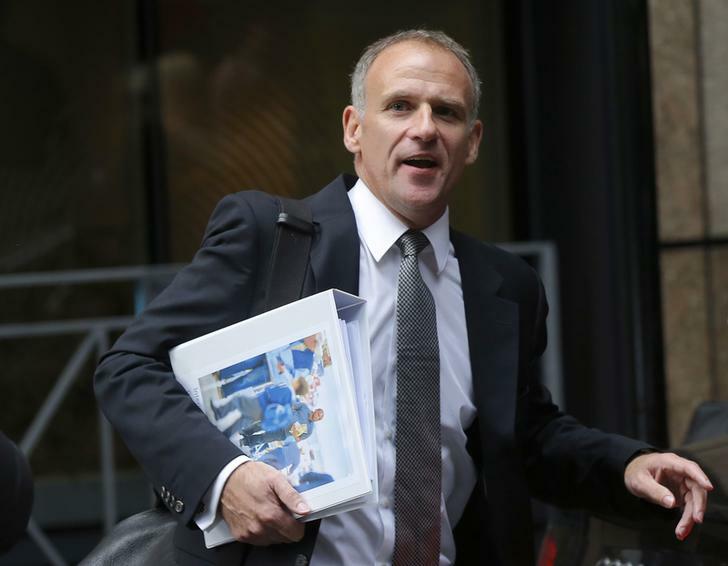 Tesco chief executive Dave Lewis leaves an office, after the announcement of the company's interim results, in the City of London October 23, 2014. Tesco, the UK supermarket, made a loss before tax of 6.4 billion pounds in the year to Feb. 28, compared to a profit of 2.3 billion pounds in the previous period. Most of the loss came as the company wrote down the value of its property assets by 4.7 billion pounds. A total of 416 million pounds of restructuring charges, together with adjustments to the balance-sheet value of goodwill and stock, took the total writedowns to just over 7 billion pounds. Tesco said its trading profit for the year was 1.39 billion pounds, down from 3.3 billion pounds.